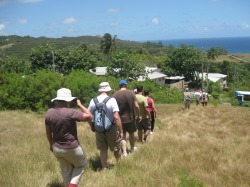 One of the Bathsheba Trails, shown here, is the popular Hackleton's Cliff Forest down to Bathsheba, via Joes River Tenantry Village. It's all downhill, with shaded forest trails, sunlit sections, rocky paths, paved surfaces, and brown sugar coloured sandy beach. 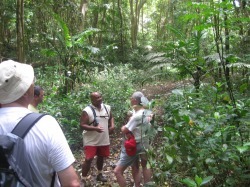 We share the history of this forested area, as well as the national tree story, and other flora like the unusual Macaw Palm. There's also the Barbados Green Monkey story, among other fauna and their various roles in this ecosystem. 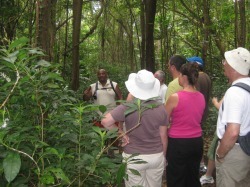 breadfruit trees, Barbados Blackbelly Sheep, and more. Of course, there's the Breadfruit Story, it's many uses, and how it is prepared. A seasonal watercourse, is Joes River, which drains rainwater from the hilly interior. Here, in this photo it's just a stream emptying into the Atlantic Ocean, but on occasion it's a raging torrent, impossible to cross. Brief geological highlights are in store on this rocky coastal section, also look closely among the rocks for tiny shell movements! 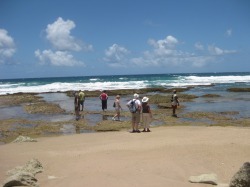 The famous Bathsheba Soup Bowl is for surfers only, but the many tidal pools are great for wading and relaxing, and unwinding. Annual international surfing competitions have become a regular feature at the Soup Bowl. 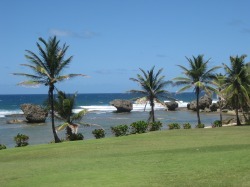 Bathsheba is a rustic coastal village, very popular as a get away and picnic venue for Barbadians and visitors too. 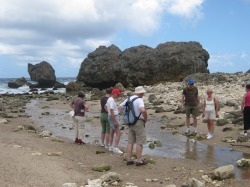 The old Barbados Railway trains stopped at this location on scenic Bathsheba.